SIHH 2014: A Lange & Söhne Introduces The Richard Lange Perpetual Calendar "Terraluna"
By the numbers, here’s what we’ve got: a perpetual calendar regulator-dial watch, with instantaneous jumping month, day,leap year, and big date indications; there’s also an indication of the power reserve. Total power reserve is a minimum of 14 days. Thought this alone would make the Terraluna a compelling, technically sophisticated watch, it’s when you turn it over that you see how it came by its name: on the back is a lushly seductive orbital moonphase display, which shows the age and phase of the Moon, the position of the Moon in its orbit relative to the Earth, the Earth itself as viewed from a vantage point above the North Pole, and the Earth’s daily rotation around its own axis relative to the Sun, which is represented by the balance of the movement. 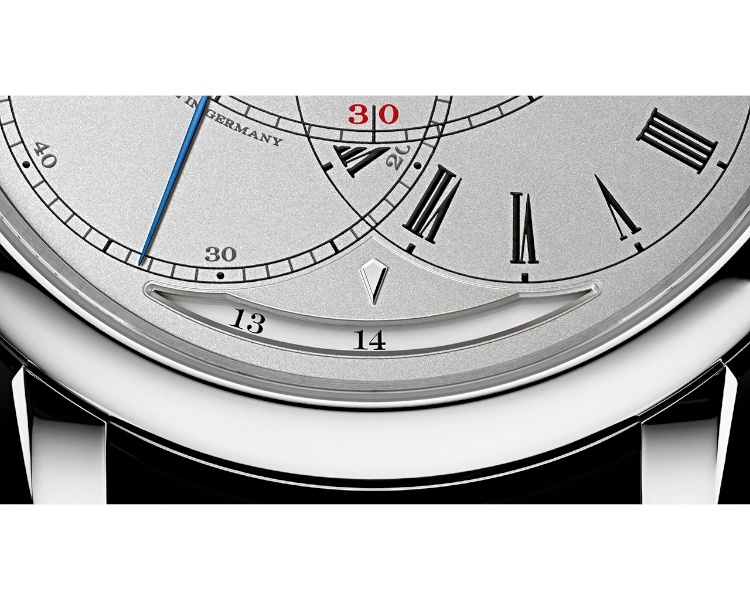 The design of the dial is based on a regulator-dialed pocket watch, completed in 1907 by Johann Heydrich Seyffert, which is in the collection of the Mathematics and Physics Salon in Dresden, near Glashütte. 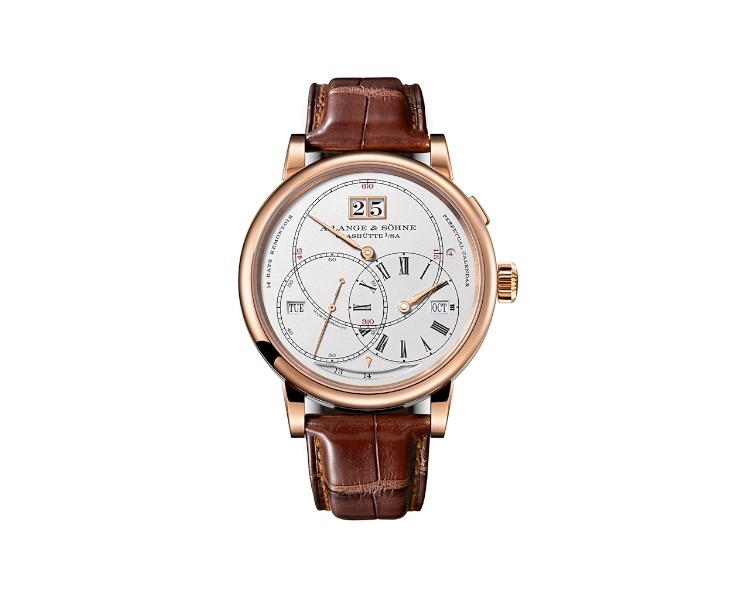 The long power reserve is managed with the same device that Lange & Söhne uses in the Lange 31: a train remontoir. The remontoir is a horological complication whose purpose is to provide an unvarying amount of energy to the escapement and balance throughout the entire running time of a watch, to compensate for the gradual diminishing of torque from the mainspring. 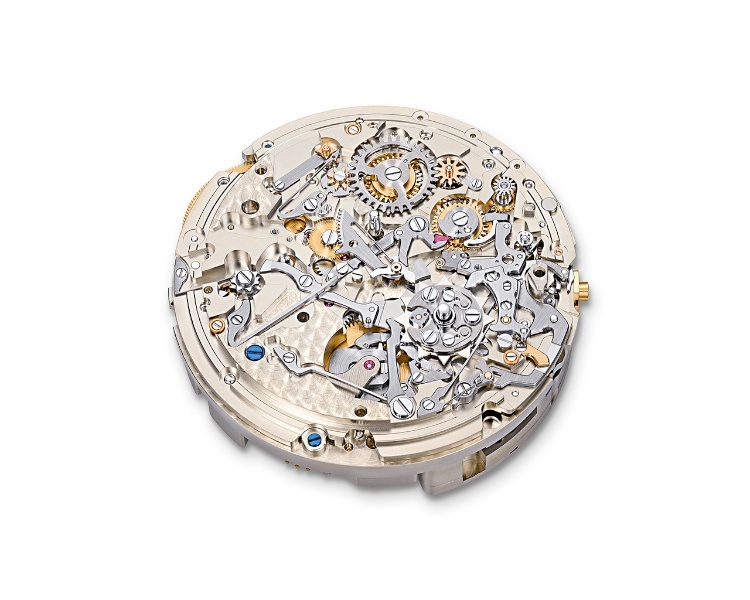 This is achieved through the use of a spiral spring on one of the going train wheels –in this case, the fourth wheel of movement, Lange calibre L096.1 –which is periodically re-wound by the energy of the mainspring (cal. L096.1 has two mainspring barrels.) 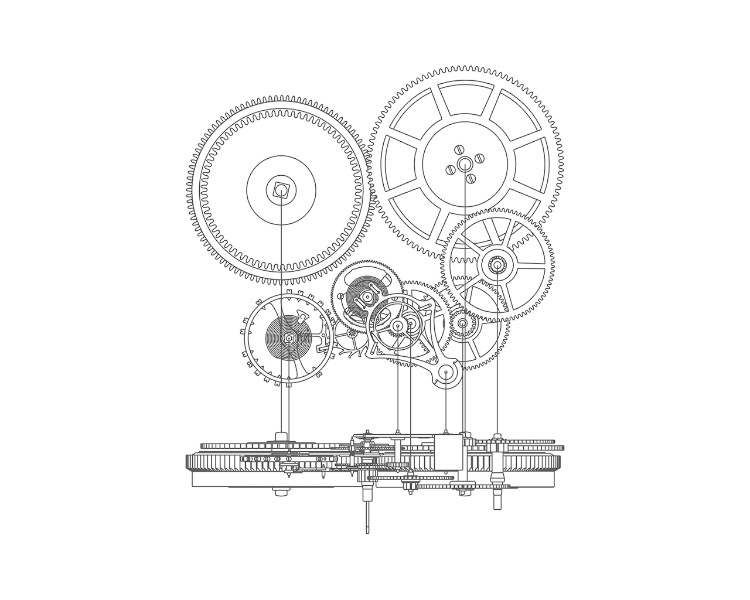 The frequency with which the remontoir spring is re-wound is controlled by an anchor escapement, which alternately locks and unlocks a single tooth on a remontoir wheel; a three-lobed cam controls the position of the anchor, allowing its two jeweled pallets to alternately release and lock the tooth on the remontoir wheel. Closeup and schematic of the Terraluna remontoir. 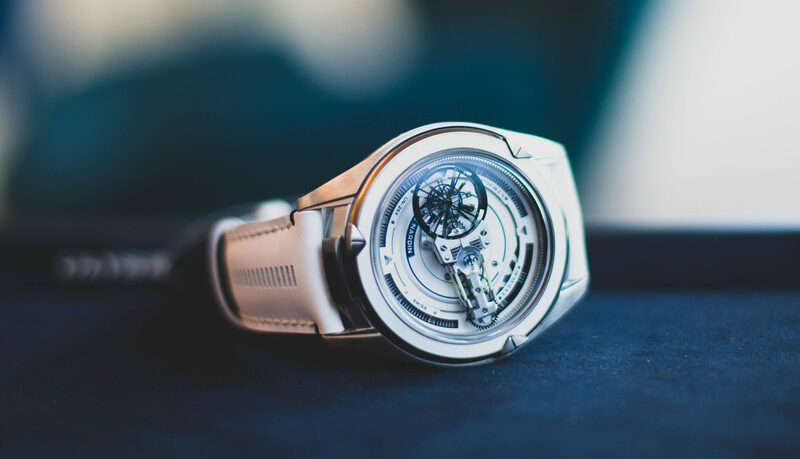 The perpetual calendar indications jump instantaneously thanks to a rotating cam, which enables the calendar mechanism to gradually store the energy necessary to change the calendar indications instantaneously at midnight. Dial side, showing the perpetual calendar mechanism; snail cam for instantaneous display jump visible at 2:00. A 24 hour scale is also provided, which allows the rotating Earth disk (there are a total of 3 white gold disks for the astronomical display) to function as an indication of the approximate time around the world. The sky disk gets its pure, deep blue color from what Lange coyly calls a “special coating process” which uses interference effects to filter out all non-blue light; there are over one thousand stars on the sky disk. One full rotation of the Moon around the Earth corresponds to a synodic month –the name “synodic” is derived from a Greek root, which means, “with the way of the Sun.” The synodic month differs slightly from the sidereal month, in the same way that the sidereal day differs slightly from a solar day; a synodic month is the amount of time it takes for the Moon to return to a particular position with respect to the Sun; whereas a sidereal month is the amount of time it takes for the Moon to return to a particular position with respect to the background stars. Just as a solar day is slightly longer than a sidereal day, so a synodic month is slightly longer than a sidereal month, and for the same reason –not only is the Moon orbiting the Earth, the Earth is also moving in its orbit, which means the Moon has to actually move slightly more than one full orbit in order for it to appear to return to a particular position with respect to the Sun. The length of a lunar month is actually slightly variable from one month to the next, thanks to the eccentricity of the Earth’s orbit around the Sun as well as the Moon’s orbit around the Earth; it can vary by up to seven hours over the course of a year. 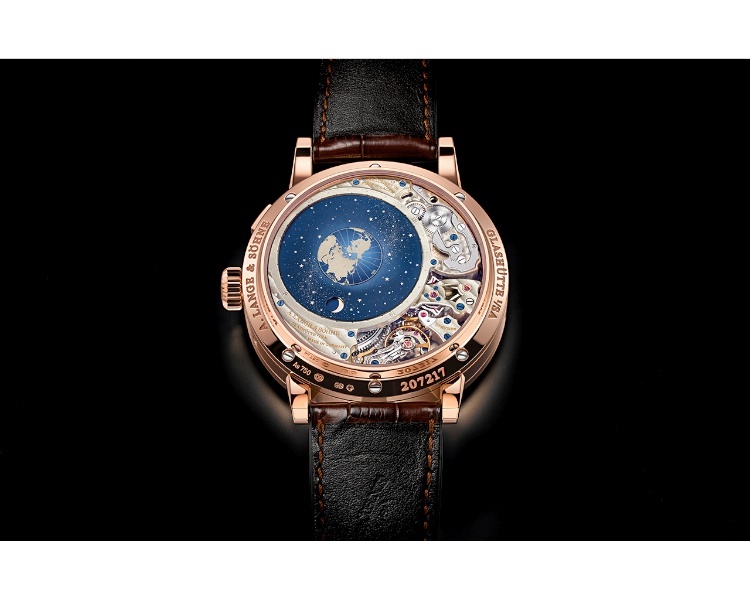 However, the mean synodic month, of 29 days, 12 hours, 44 minutes, and approximately 3 seconds, is generally used for calculating the accuracy of a moonphase display; the Terraluna is accurate to one day within a period of 1058 years. 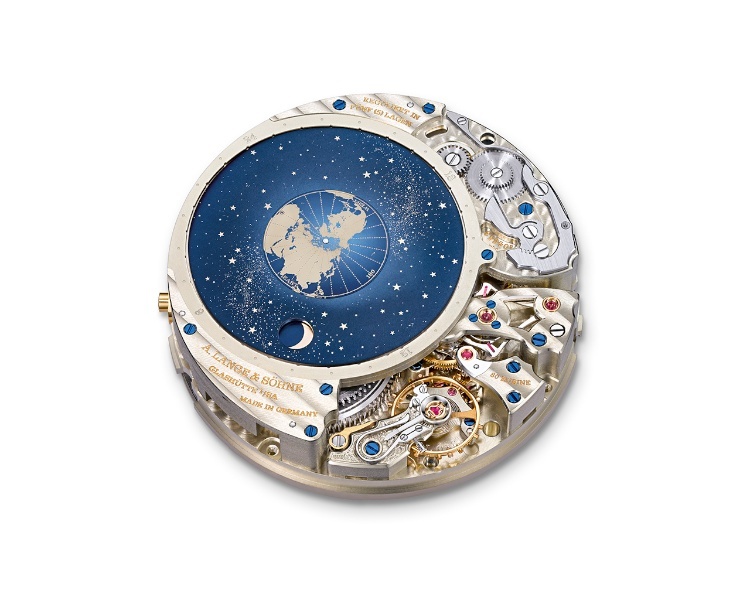 Other than a moonphase complication (and, of course, a perpetual calendar, which thanks to its relationship to the period of the Earth’s orbit is considered by some to be an astronomical indication) this is the first astronomical complication to be produced by A. Lange & Söhne. 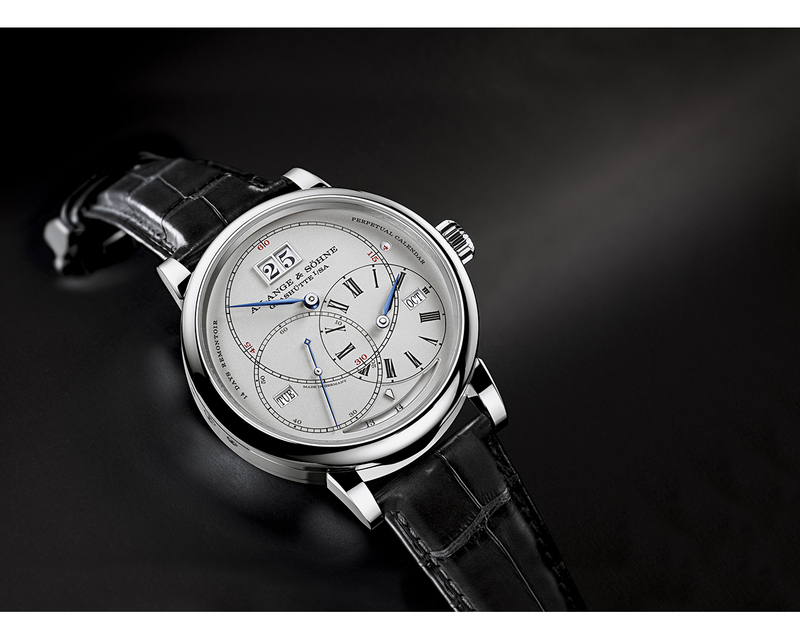 The Richard Lange Perpetual Calendar Terraluna is offered in either white or pink gold. Case, 44.5×16.5mm. 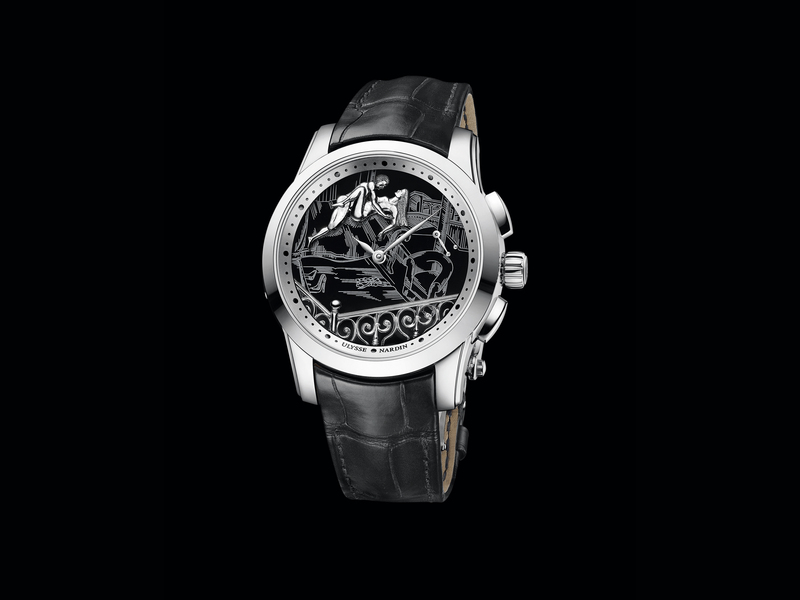 Movement, the Lange calibre L096.1, instantaneous perpetual calendar with big date, indication of the power reserve, lunarium on the reverse with 24 hour indication; frequency 21,600 vph; 14 day minimum power reserve, with in-house Lange remontoir on the 4th wheel of the going train; lunarium accurate to one day in 1058 years. 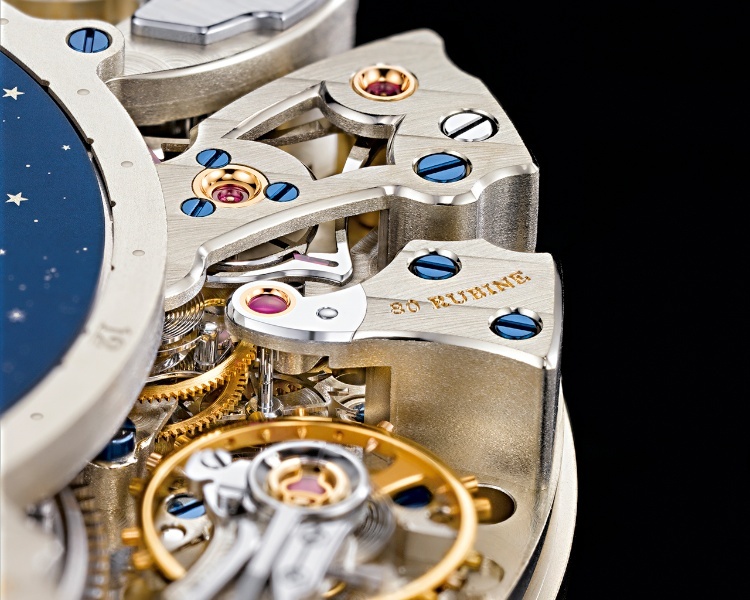 Movement in untreated German silver (maillechort) 37.3×11.1mm. Price: $216,400 in white gold; in pink gold, $215,100.